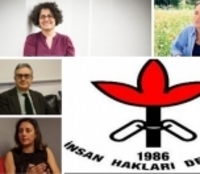 Human Rights Association (İHD) has released a statement and demanded that 13 detained academics and civil society representatives be released. "We would like to indicate that we are condemning the treatment of Prof. Dr. Turgut Tarhanlı, who has been struggling for the rule of law for a long period of time and raised several people of law, and other detained people, considering that they are defenders of rights. "The treatment of Turgut Tarhanlı and the ones who have been taken into custody along with him has manifested that laws have been arbitrarily enforced in Turkey and the political power can treat anyone in the country as it sees fit by way of oppression via justice. "We are making a call to the political power to give up such methods of oppression and demand that the detained people be immediately released." An operation was launched against two academics from Boğaziçi and İstanbul Bilgi Universities and people from civil society on November 16. It has been reported that a detention warrant has been issued for 20 people.